The thought of French food conjures images of creamy sauces, wine braised meats, and crusty baguettes spread with stinky cheeses and brandy kissed pates. Barbecue certainly doesn't come to mind. But award-winning author Susan Herrmann Loomis, argues that the French invented barbecue. 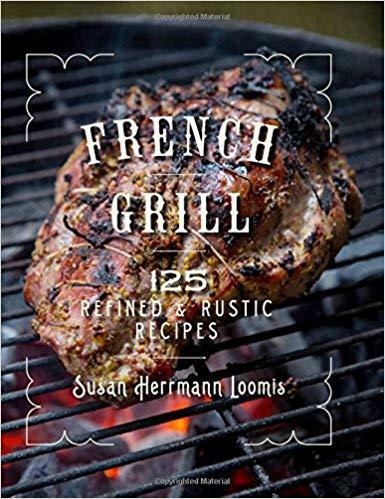 In her newest cookbook, French Grill, Loomis tells us it was the ancient Gauls (50 BC) who hunted the forests of what is now Brittany, the Loire Valley, and Normandy. Their prized meats - wild boar, deer, rabbit - were roasted from "la barbe á la queue," meaning the beard (or head) to the tail, hence the invention of the word and technique barbeque. Recipes from the French Grill range from rustic to refined and are straight-forward and easy enough for the home griller. Loomis shows readers how to get the fullness of flavor out of food without the rush to sear, carbonize, or blacken - it's all about obtaining the "kiss of smoke" to elevate the flavors. She covers how to prepare an entire meal over the grill with beautiful full-color images. Before getting into her 125 recipes, Loomis covers the basics of grilling: the season, the gender gap of women grilling (girls can grill too! ), gas versus coal, ingredients for the grill, flavor and smoking foods, essentials for the French grill, how to build and fire, and more. In Amuse-Bouches (Appetizers), you'll discover small bites such as Smoky Olives and Caramelized Dates Stuffed with Almonds along with suggested aperitifs (beverages served before the meal). The chapter on First Courses, or entrées, includes Aioli with Autumn Vegetables from the Grill, a smoky, French-Style Gazpacho, and Impressionist Vegetables from the Grill, a happy melange of grilled veggies served with yogurt and generously sprinkled with smoked paprika, a drizzle of cilantro oil, and seasoned with fleur de sel (flower salt). Next comes the stars of the show: Poultry, Fish, Rabbit, and a bit of Tofu. You'll love Loomis's French version of Hot Chicken. Her Devil's Hot Toad Chicken, so called because the chicken resembles a toad once it's spatchcocked (breastbone removed and flattened), is seasoned with butter, piment d'Esplette (a medium heat pepper), sweet and spicy smoked paprika, Dijon mustard and fresh herbs. Her Duck Breast à la Voûte recipe is intensely flavorful with seasonings such as lime, tamari, fresh ginger and garlic, sugar, fresh cilantro and pairs beautifully with a Côtes du Rhône wine. For the non-meat eater, try the Ginger Tofu Steaks with Melted Spinach, a delightful dish that's seasoned with Dijon mustard, freshly squeezed orange and lemon juices, tamari, sesame oil, and fresh garlic and ginger. Red meat lovers will swoon over the chapter on Lamb, Beef, and Veal. 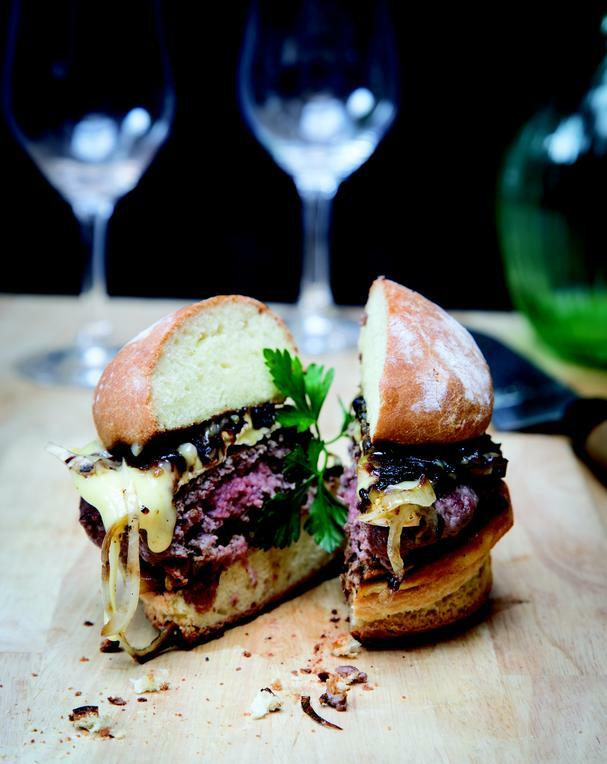 Featured below is the recipe for her mouthwatering Camembert Burger: The Best Cheeseburger You'll Ever Have, and be sure to try the classic French Grilled Steak with Frites on page 148. If you're looking for a quick and easy dish (yes, it's possible to get a grilled dinner on the table in less than an hour! ), try her Dinner in Twenty: Sausages, Vegetables, and Garden Herbs. For a crowd, grill up some Smoky Pork Should à la Française, an unctuous dish seasoned with grainy mustard, beer, herbes de Provence, garlic, and a bit of honey. Her chapter on Side Dish Vegetable and a Few Grains offers an abundance of simple seasonal dishes from Grilled Lemon and Thyme Broccoli and Basic Grilled Leeks to Garlicky Curried Eggplant and Grilled New Potato Salad. Loomis also features 19 delectable dessert recipes all adapted for the grill - even cakes and cookies like her Flourless Chocolate Cake on the Grill and Sablés: Normandy Sand Cookies! To end her beautiful cookbook, Loomis includes a final chapter on Basics: The Building Blocks, which include basic recipes to help elevate the flavor of grilled and non-grilled dishes. Basics include sauces, vinaigrettes, mayonnaise and aiolis, herb oils, flavored sugar and salt, spice mixes, and pastry. It truly is a must-have cookbook - I hope you enjoy! Place the ground meat in a medium bowl and add the seasonings and parsley. Mix all the ingredients together, preferably with your hands, so they are thoroughly combined. Take a small piece of the meat and cook and taste it so that you can adjust the seasoning to your liking. Form the meat into eight individual burgers, flattening them. Build a medium- size fire in the grill. When the coals are red and dusted with ash, divide them in the barbecue, putting half the coals on either side. Set the grill over the coals. If you've got one, light up the gas grill, too, using all three burners. First, prepare the onions and the apples. You can do this either on a plancha or in a cast- iron skillet right on the gas grill or the barbecue over a very hot fire. Melt the butter and the oil together and add the onions. Stir, season lightly with salt, cover the grill, and cook until the onions soften and turn golden, 5 to 8 minutes, checking them often and stirring to be sure they don't burn. If they turn dark golden at the edges, don't be concerned; this enhances their flavor. Remove the onions from the pan and add the apples, stirring into the remaining oil in the pan. (If there isn't enough, add 2 teaspoons oil and a scant tablespoon of butter.) Cook the apples until they are golden, 3 minutes, stir, and continue to cook until they are tender and golden through, an additional 5 minutes. Remove from the pan. Taste both the onions and the apples for seasoning, and reserve. When the grill is hot, place the burgers right over the coals and cook until they are golden and beginning to cook through, about 4 minutes. Turn, cook each burger until it is golden, about 2 minutes, then top each burger with two slices (or more, to your taste) of Camembert, cover the grill, and cook until the burgers are the doneness you like and the cheese is softened but not entirely melted, an additional 2 minutes for medium-rare. If you like your burger closer to medium, leave it on the grill for an additional 2 to 3 minutes (not too much longer or the meat will be dry). Transfer the burgers from the grill to a plate or platter and let them rest. Place the buns, cut side down, right over the coals until they are toasted, about 2 minutes. Remove them from the grill. To assemble the burgers, slather the cut sides of the buns with mayonnaise (if desired). Divide the apples among the bottom half of the buns. Top with the burgers, cheese side up. Garnish with the onions, and top with the other half of the bun. Press down firmly on the burger, which helps to keep the whole thing together. Serve immediately. ASTUCES: Make sure that the ground beef you get is medium- fatty, not too lean. Also note that I use both a charcoal and a gas grill for this recipe because I'm lucky enough to have both options. The onions and the apples cook better over gas because the heat is a bit more even. But I love the burgers over the coals, because they pick up a slight smoke flavor. You may, though, decide to make life simple by cooking everything over the coals or over gas. Finally, you are likely to have Camembert left over. Don't despair— it's amazing at room temperature with bread or atop a salad.